What Are GPS or Bluetooth Trackers & Who Needs One? Answering the 2nd part of that question is much easier than the first..
so I’ll address that first. Who Needs a Bluetooth Tracking Device? Anyone who frequently misplaces objects that they rely upon could benefit from attaching a tracking device to those objects. It would help them to find it the next time it’s misplaced. Someone who worries about leaving something behind…their purse, an umbrella, or forgetting their wallet or cellphone at home…could benefit from using the kind of tracker that alerts you when you’re too far away from an object you’ve connected to the tracker. People with pets that stray can also use these devices to prevent them from straying too far. What Exactly are Bluetooth or GPS Trackers? The term GPS tracker is primarily used today to describe a tracking device with built in bluetooth technology that allows it to pair to a cell phone or a mobile device for the purpose of keeping track of the prized possessions they fear they may lose. These comprise a whole genre of gadgets that’s been on the market for roughly the past 2-4 years. But use of the GPS label is actually erroneous because while these devices do provide assistance in locating possessions they don’t accomplish that using GPS technology. While true GPS trackers do exist they comprise a smaller market. Almost every device that you’ll encounter in 2017 that’s referred to as a GPS tracker, in fact really isn’t…these are really bluetooth trackers pure and simple. One way to differentiate between the two is price. Bluetooth trackers range in price from around $8-35 whereas trackers which use true GPS technology tend to run over $50. TrackR is the main product line of one brand of bluetooth tracking device. 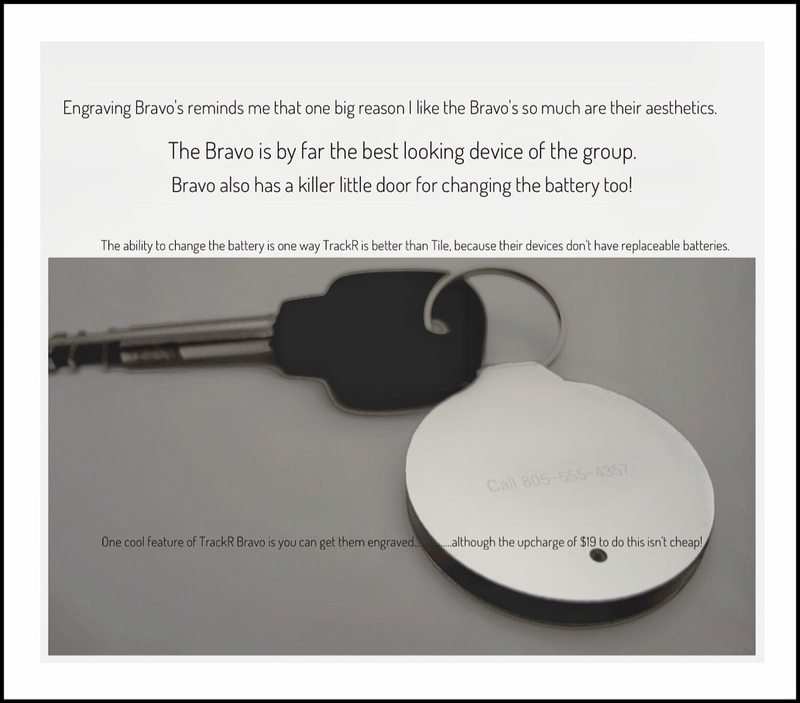 I recently acquired several TrackR Bravos…TrackR’s flagship model is the Bravo. My acquisition has introduced me to this whole new world of bluetooth tracking devices. You might think that these newer gadgets are simply key locators…because many of them resemble products sold specifically for that purpose. However, these newer devices differ from their older predecessors…like the key locators…in that they include bluetooth communications or BLE for short. Therefore most of these tracking devices also have companion apps which you use to manage and track your things with. Below is a screenshot for Tile’s product line…one of the most popular brands currently. Some other popular brands of tracking devices that directly compete against the TrackR brand includes Tile, which appears to be hands down the best one that’s currently available, as well as Chipolo, Pixie, Mynt, Voilà, Tintag, iBeacon, Pebblebee Honey, Protag Duet, XY FindIt, iTag’e Nut Mini, Great Vibez, and Pally Smart Finder. Since the one that I own is a TrackR brand device…more specifically it’s a 2nd Generation TrackR Bravo…that’s the one I’ll explain how to setup and begin using. I was engaged in my daily review of current tech news on Twitter when I happened upon an info-ad for an intriguing device called TrackR. This was really intriguing for me because I misplace far too many things…something I blame on my severe ADHD. More intriguing still was the beautiful design of the Bravo. But the clincher for me was the quantity discounts that were offered for buying multiple Bravos. I can’t pass up an amazing deal and I really thought everyone in my family needed these! Although these trackers belong to a whole new genre of devices there’s still a lot of people using them as key finders. I wasn’t exactly sure what I’d be using them for yet…but I definitely knew that I needed something like this! Here’s a great introduction to the TrackR brand of bluetooth trackers. TrackR Atlas (a whole house whole family solution) too. The TrackR device itself connects using bluetooth to your cellphone via the TrackR app. After pairing it with your phone, you can attach the little TrackR device to things that you’re worried about losing with the enclosed double-sided sticker or using this little ring that’s sort of like a key ring that’s also included, or even just by placing the tracking device inside of something like a wallet or a purse. Then you use your phone and the app to locate the missing item if it does indeed go missing. Indoor Use | How Well Does TrackR Bravo Work? When you attach TrackR to something you misplace frequently, the next time that happens you can locate it by walking around your house with the app open on your phone or tablet. As you walk the app tells you if you’re getting closer or if you’re moving farther away from it. When you’re pretty close to it…say within about 40 feet, you can have the TrackR app initiate the little tracking device to play an audible alert sound that helps you to better pinpoint its location. You can even use TrackR on your pet! It took me a few months to figure out what I should use as my test case for the TrackR Bravo. At first I couldn’t think of anything I really needed it for despite my certainty that I needed 8 of them. But now it’s springtime and as I was hauling out all our house fans I remembered one thing that I’m constantly losing are the remote controls to our house fans…because I only buy fans that come with remote controls! For some unknown reason fan remote controls are always disappearing from our house. Maybe it’s because the remotes themselves are usually tiny and they can easily slip into couch cushions, onto the floor, or end up in someone’s pocket. But that will no longer be the case at my house!!! Because from now on every remote that we tend to misplace will have a TrackR attached to it. When you add a new TrackR device you name it, so they are easy to tell apart. Using it for our fan’s remote controls is a perfect use for it, imo. That’s because of the inherent limitations of bluetooth. Being a near field communication means that you need to be pretty close to something in order for it to communicate. Usually the missing remote is in the same room as the fan. But they are often so tiny that they are easily overlooked. It was this exact scenario that gave me the idea to test out TrackR for this purpose. Once I located a missing remote control I’d been searching for, I attached a Bravo TrackR to it using the included double stick tape. When I had the remote prepared I conducted my test. I left the room and walked pretty far away, and then opened the app and made my way back towards the room the remote was in. I was halfway down a long hallway leading to the room when the TrackR showed on my iPhone. I’d say I was about 35 feet away from it…which frankly didn’t seem very far to me! But that brings up another inherent limitation of bluetooth…or really of the radio signals bluetooth relies upon. Radio waves have difficulty penetrating thick exterior walls, and it just so happens that the wall between me and the remote in question was formerly an exterior wall. In fact, because we’ve added onto our house several times and we have quite a few situations like that. So in the end, while I think my TrackR Bravos will function well for remote controls in our home…it may not work as well for other kinds of potentially misplaced items. I’ll need to do some more testing to see if these kinds of devices will work out well in our house on a larger scale. I’ve just explained how TrackR Bravo works indoors…but it works outdoors too and it can perform well even at very great distances. You might be wondering how that’s possible since bluetooth is near field communications which only functions at maximum distances of about 100 feet. It does so using a newer innovation they call ‘crowd sourcing.’ Part of what I found intriguing was that these different brands of devices utilize a crowd sourced feature which helps to locate items that have really been lost. But here too there are some inherent limitations with that technology which impacts all of the brands equally. The way the crowd sourced feature works is this. If I have a TrackR connected to any item and I do happen to misplace it, as long as the battery in the TrackR still has juice, if my TrackR encounters other people’s TrackR’s or their app-enabled cell phones, their sheer presence will bring about a logging event and my app will ultimately be updated showing an approximate location for the missing item. As a general rule, although most device makers claim their batteries last for a year’s time…reading reviews reveals that 4 months appears to be the true sweet spot for most of them. Here are a few more things to know about these crowd sourcing features aside from the fact that I think overall it’s a really cool concept! In discussing other brands I talk more about below, this crowd sourced functionality is one key aspect which helps to differentiate between the lo-tech but modern-day key finders and the newer personal tracking devices. When I include crowd sourcing as a feature throughout this post, I’m referring to a user community based service in which all user devices crowd-assist to locate any lost item connected to a tracker. Also, the ultimate success of this concept is highly dependent upon the popularity of the brand. So in the case of my TrackR, it’s ability to find a lost device will be dependent upon where the item is lost and how many other people might be around it who are also using TrackR brand tracking devices. While the chances for success are better in larger metropolitan areas than anywhere else primarily because there will be more people around using TrackR’s…unfortunately, you can’t always choose where you’ll lose something! TrackR has a webpage that you can use to see how many devices may be located in your area. When considering buying different brands of these devices, the chances are greatly improved that this crowd sourced feature will be useful to you, when you get a tracking device from a company that’s doing really well both the industry as a whole, and also in your locale…which it appears TrackR is for me. In order to test out the crowd sourced functionality I ended up creating a 2nd account for the 2nd TrackR I attached to a fan remote. Truth be told I hadn’t thought of this initially but discovered it after reading a user review of TrackR’s ios app that stated you’re not allowed to use symbols in your account password for the app. But the app doesn’t warn you of this and accepts the password. So when I went to connect with the 2nd TrackR to my account I wasn’t able to even connect to my account again. I was forced to set up the second account. This is a huge problem for TrackR and one they need to fix…but I’m sure I’ll get it straightened out when I bother to try. In the meantime it gave me the perfect opportunity to check out the crowd sourcing feature. I’m pleased to say that crowd sourcing worked beautifully! Within an hour of setting up the second TrackR I got a notification from TrackR that one of my TrackR’s had been located via crowd sourcing. That was actually me…but now I know the crowd sourced location feature actually works! How Popular Are TrackR’s Currently? Right now, from all the research I’ve conducted it appears to me that there are 2 brands that really stand out in this category…Tile and TrackR. 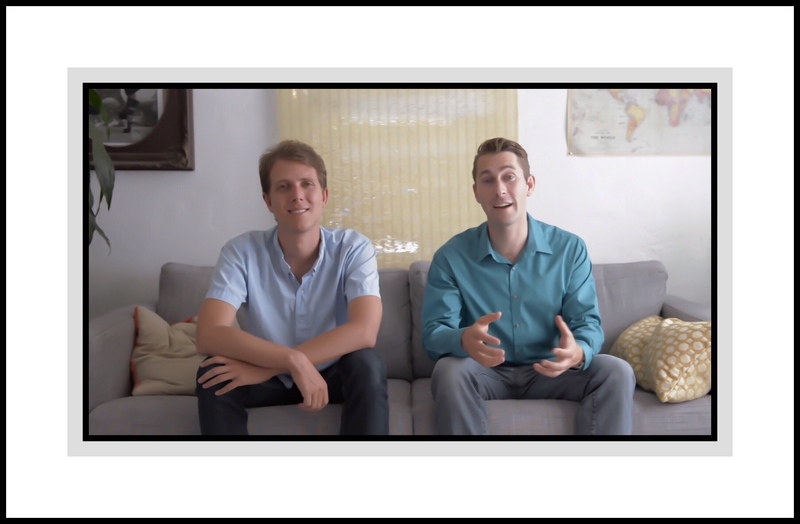 Tile holds the distinction of garnering the highest praise in both written and YouTube reviews. Next in line comes TrackR…but my perception could be faulty. I say this for 2 reasons. First, it’s clear that right now TrackR is having difficulty fixing its apps. The problems appear to be universal or across all apps. TrackR’s biggest problem right now? Their apps don’t actually locate anything accurately…which is a HUGE problem for a product that’s sole purpose in life is to find things! 2nd, while there are more reviews written and videos shot by far for both Tile and TrackR…both also appear to have a lot of dissatisfied customers! One good way I discovered to see how happy user’s are with their brand is by reading their companion app reviews. While refreshing my memory of all the TrackR’s features on their website I discovered something that I don’t think I realized before…there’s a separate free TrackR app for ios devices, that’s above and beyond the main TrackR app that you’d install to manage a new TrackR device. Below is a link to what I read. I may have seen this before and discounted it, thinking ‘but I use Apple’s ‘Find My Phone‘ app already…how is this different?’ There’s really only one small difference…but I now realize that it could make a huge difference for someone. Why TrackR’s Tablet App May Be Amazing! The difference is that you don’t need an internet connection to find your lost device using the TrackR app for ios. So, unlike the ‘Find Your Phone‘ app, if your device goes offline, it can still be tracked and located. How do I know this could make a huge difference? Because a friend of a friend had his iPhone stolen while using mass transportation in Mexico last weekend. His brand new, very expensive iPhone 7 was taken along with several wallets of friends and some other things. Most of the items were retrieved because some Mexican cops arrived on the scene immediately and shook down the perps…can you tell I watch too many cop shows? But the iPhone wasn’t recovered. He wiped his data from it once he had an internet connection…but he couldn’t use ‘Find My iPhone‘ at the exact moment of the theft because he had no other internet capable ios device on hand. If he’d had the TrackR app installed on a friend’s device he might have been able to discover exactly who had his phone while the arrest was occurring by having the friend who’d also installed the app initiating the phone’s ringer until it was located. Another reason the app may be so great is because you can have up to 10 other ios devices paired to also be tracking your device…in this case your iPhone. If you’re using the Android app you can pair up to 3 devices. Although it’s unclear to me whether or not you could pair the ios app to an Android phone…I tend to think that’s possible from everything I’ve read so far. If I’m correct, there’s a whole wealth of free utility there that would be wonderful for young adults who are backpacking through Europe or enjoying their Spring Break’s in Florida. So the ios app offers some interesting utility. Of course if the device’s battery is dead you can’t use the ‘phone ringing’ alternative…although you could still track it as far as it’s last known location. I first discovered this YouTube channel by Modern Day Family Man (MDFM) while writing this article. This guy seems to be obsessed with bluetooth trackers…which for review purposes isn’t a bad thing. The video I originally shared when I first published this is his ‘Tracker Versus Tile – the Ultimate Showdown.’ From there if you just tap or click on his channel name, you’ll see that he’s quite prolific when it comes to testing, comparing and reviewing Bluetooth trackers. The genius behind some of the techniques he uses to measure functions and features of various devices is as entertaining as it is informative. If you want the latest, most current comparison information Modern Day Family Man’s channel is definitely The Place to go! There are a few more reasons I think his channel is probably the best place to begin your research…especially if you’re seriously interested in this market and intend to buy several Bluetooth trackers. Because what I realized as I learned more is that most people do end up getting several tracking devices. So sticking to one brand makes a lot of sense for simplicity and ease of use. But because this market is booming right now, the number of new devices seems to be expanding daily, which makes it nearly impossible to stay on top of without dedicating a lot of time. Thankfully, MDFM’s channel really does do all the legwork for you. You’ll notice too that immediately below his videos he gets a lot of viewer comments. He monitors those well so that when viewers ask questions his answers are timely and detailed. The reason I stated in the title above ‘today‘ is because this rapidly changing marketplace appears to me to be beyond saturated. Many of the devices really don’t vary that much, so little feature differences is where focus needs to be. One thing I think is a bit odd is that despite all indicators that this is a mature, perhaps over-saturated market…very few people appear to really even recognize their existence much less use these devices. This seems to hold true for both my own circles as well as those I write for. Either that or it’s something no one ever discusses. Yet there are tons of brands and entire product lines within manufacturers making the competition fierce! Each model seems to be continually updated and brands are constantly improving their technology to outperform their perceived competitor. Granted this is good for us, the end user. But that reality doesn’t make the initial selection of one of these brands an easy endeavor! I did research things a bit before I got my 8 TrackR’s…but that was a few months ago, and like I said, this marketplace is a moving target! If I were buying one of these today, I’d be inclined to get iTag’s Nut Mini at $14.95 or a 4 pack of them for $40. Why? Because the Nut Mini does everything that the TrackR Bravo does at half the price and 3/4’s of the size. In reading Amazon reviews of it, one person said it was so small they put it on a mini drone. I happen to have a mini drone too…and they are really tiny! I doubt that I could hang my TrackR Bravo from it. Another person said they put it on their Roomba. I thought that was funny because I have an older model Roomba too. Mine never got lost because it never worked all that well…but I liked the review and it made me think of a few more ways someone could use these devices. Below are just a few of what I think are currently the best bluetooth GPS tracking devices…but remember…if you’re reading this even a few months after May 2017…these may not be the best ones anymore. First is the Tile because it’s universally ranked as the best by virtually everyone who matters. Maybe that’s because Tile was the company first to market with this kind of device? Tile Mate seems to be the most popular model of Tile currently priced at $24.99 for 1 unit. I cover some of Tile’s feature information in the screenshot below and more in my comparison between Tile and TrackR immediately following this section. I have to include TrackR Bravo…because it’s what I have and it’s the whole reason I even wrote this article. So far the 3 Bravo’s I’m using have been fine although other than checking to see where they are occasionally I’ve not done too much with them. One problem I did have was that I had to setup a 2nd user account I think because I used symbols in my password for the 1st. An 8 pack of Bravo’s is where you save a lot and that’s what I got. An 8 pack at Amazon is currently $150, which comes out to $18.50 per. But I got mine directly from TrackR’s website. When I got mine it was during some kind of promotion and they had 8 for $116 or $14.50 each…so that’s what I paid…and shipping was free. It seems like they always have some kind of promotion going on. For example, I received this Share URL from TrackR after I set up my account. If it’s used by someone else, the person using it gets 1 free TrackR with their purchase of one and I then also get one free too! Another example is at their website currently if you buy 10, it’s $180 with free shipping so it’s $18 per unit, or just a little better than the per device price of their current Amazon offering. As I discussed above if I was going to be starting afresh with these I think I’d be getting iTags Nut Mini’s. A single Nut Mini is currently $14.99 at Amazon. One reason I really like the Nut Mini is because they are cute…I think because if their tiny size. The photo below doesn’t really give you an idea of it’s size however. But my main reason is they appear to offer all of the same features as the more expensive TrackR & Tile Mate. Here’s a pretty decent video review of the Nut Mini. This next one…the Great Vibez Smart Finder Bluetooth Tracking Device at $19.99 I was impressed with because so many people switched to it from Tile. I discovered Great Vibez while reading ios apps reviews for apps related to the TrackR app. It was really the reviews for the Great Vibez that were so compelling for me. Not just the product reviews alone, but the fact that so many of them were from former Tile users. Also their app has great reviews. Because Tile and TrackR are the number one and two brands on the market currently I’d be remiss in not discussing the differences between the two. Both brands have similarly priced trackers and both brands have a product lineup that includes several different trackers for different purposes. For example, they both offer a flat credit card sized tracking device that’s designed to either go inside a wallet or to be attached to a laptop. Both offer batteries in their devices that they claim last for about a year. But there is one significant difference between their batteries. The Tile battery is a sealed battery, therefore when the battery dies your device no longer functions. You need to get an entirely new tracking device from Tile. They do offer a ReTile program however which provides discounted models to their existing customers. They also offer a warranty on their devices and batteries, so that if your battery dies before a year’s time has elapsed they will replace your Tile tracker for free. The battery in the TrackR device on the other hand is user replaceable so even if it doesn’t last for a year, it’s somewhat superfluous because the battery costs about a dollar. There is one other significant difference with the two batteries however that is the Tile’s battery is rated specifically as waterproof whereas TrackR’s battery they say is water resistant but they don’t provide an actual specification for that. They do however offer for sale a little waterproof silicone sleeve that you can buy an add on to your TrackR. In the bigger picture overall currently Tile seems to offer a better product. Their product has louder sound alerts, it offers a farther distance range, and they offer overall better reliability and consistency with their products. TrackR’s products right now seem to have a lot of problems. Yet review after review consistently ranks Tile as number one and TrackR as number two. The one other difference between the two brands is that the TrackR brand offers one feature that the Tile brand doesn’t. That feature is a separation alert function when you move too far away from an item that you’ve attached a tracking device to. Tile does offer an alert that TrackR doesn’t offer however and that is an alert to tell you when your battery is beginning to die. So while it appears that currently Tile is vastly superior to TrackR all the reviews really don’t support that theory. Nor does my own experience with TrackR… except for the problem that I have with my passwords. I mentioned this somewhere else with my post but I’m mentioning it here again because it’s an important problem to know about. I read in iOS app review for TrackR that TrackR does not allow you to use symbols in your passwords. I use DashLane as my password manager and I had DashLane generate a password for me that had symbols in it because I hadn’t read that review yet. When I went to set up my second tracker, I wasn’t able to log into the account that I had set up for the first tracker. So I believe that the ‘no symbols rule‘ does apply, yet TrackR fails to mention that anywhere in their literature and I’ve got a little bit of a mess to straighten out with my accounts. So heed my warning if you’re a new TrackR user right now and do not use symbols in your passwords. I decided to include what I thought was the best of the key-finders, so you could see how difficult it is to tell the true blue-toothed tracking devices with crowd sourcing from what is essentially a regular old key finder, albeit one that’s been updated and looks pretty cool, apart. The easiest way I found to understand the key differences is to see some of them. So below I’ve included the best GPS trackers I could find currently at Amazon. The main difference between a true GPS tracking device and a bluetooth one is that true GPS trackers include a physical piece of hardware in them known as a GPS receiver. This is necessary to receive the radio signals that are broadcast for GPS purposes. Because bluetooth trackers are always connected by BLE near field communications to a mobile device such as a tablet or a cellphone, the inclusion of a GPS receiver in them isn’t necessary…the mobile device already has it. So you can think of it like this. Bluetooth trackers need a companion device to connect to whereas true GPS trackers don’t. They function as standalone devices, therefore they are both more expensive initially and more expensive to operate because they also require an ongoing cellular plan to operate. Most batteries in GPS trackers last about 2 weeks before recharging is required unlike bluetooth tracker batteries which tend to last anywhere from a month to a year, depending upon the brand and model. Most GPS trackers are designed specifically to monitor driving behavior (especially for new teens or elderly drivers) but many are adaptable to a lot of different uses as shown in the detailed information for the Spy Tec model. That’s how I discovered his channel. But they’ve also have done an excellent video on the different kinds of GPS trackers for cars which I highly recommend if you’re in the market for that kind of tracker. The Iota Tracker is made by a Redwood California based company Iotera, Inc. Redwood, CA is a short 25 minute commute to Apple Corp.’s home base in Cupertino as well as firmly ensconced in the heart of America’s infamous technological center known as Silicon Valley. I point this out because my perception is that the unique ways that the iota tracker merges its use of networking technology makes this tracker a real stand out in the industry. This is one product that should seriously be considered by those who seek a solidly performing tracker beyond the capabilities of bluetooth trackers but without the ongoing expenses of GPS trackers. It’s waterproof, it can be shared amongst several users, it uses crowd sourced location and it can send an alert when the battery needs to be charged. What devices work with the iota? The iota app works with devices having iOS 8 or later (iPhone 4s minimum), or Android 4.3 or later. For set up, you will need a device that has BLE capabilities. Check out this list of BLE devices to see if your smartphone is compatible. The Iota Tracker system is composed of 2 units. A Home Base and the Tracker device. Below is a little more information about each. The Home Base is the device that links your iota to the internet from up to four miles away. Simply plug the Home Base in, download the iota App, and pair your Home Base to your WiFi network, and you instantly have your own long-range wireless tracking bubble. Multiple Home Bases in one area combine to give users an even larger bubble for tracking. The Home Base can connect to thousands of iotas. But they all need to be using the same account. The home base can communicate with iotas that are 0.5-1 mile away in urban or heavily-wooded areas, and further in sparse, suburban or rural areas. What is an iota tracker? The iota tracker is the all-in-one, rechargeable tracking and monitoring device. The iota can report its GPS location, and ring when commanded to through the app. The iota also delivers alerts when it has left a designated area, or when the battery needs a recharge. The iota’s GPS locations are typically within 30 ft. of accuracy. Accuracy can be limited by trees, roofs, or other obstacles between the iota and the sky. What happens when my iotas go out of range? When the Home Base network notices your iota has gone out of range, the iota App will let you know that your iota could not be found, and give you the option to be notified when your iota is back in range. Meanwhile, the app will continue to show the last known location and all alerts will be delayed until the iota comes back within range of a Home Base. The system is only sold through their website from what I can tell. Last, here’s a link to their ios app. And a link to their Android app. Reviews for both are excellent! I’m including these ‘narrow focus‘ or single use types of trackers here for certain family members of mine who might not know about their existence, and might be interested in these. While the need for a cellular data plan is the one main distinction between true GPS trackers and the newer and more popular bluetooth trackers, it appears to be the case with these more expensive devices that are targeted towards specific activities that no cellular data plan is required. In each instance it seems to me that whatever communications technology is being utilized by these, that it’s included in the price and no additional expensive outlays are necessary. An EPIRB device generally only provides for a one-time use. After it’s been deployed and served its purpose, that of saving lives in the event of a boating accident, this kind of device needs to be sent back to its manufacturer for overhauling to prepare it for future service. But in reading the Amazon reviews for these, anyone who has had to deploy it is well versed in these kinds of limitations. Also, EPIRB devices are only deployable when they come in contact with water or actually when they are submerged in water…I think. These too are most often used in boating environments. But they have a much broader scope of user base too. In addition to being used by boaters and pilots as personal beacons, they are also popular among hikers, climbers and generally any outdoor adventure seekers too..especially in solo situations. Garmin is widely recognized as a leader in the GPS industry and was probably the first to come out with standalone GPS units for cars. I had one of those, it was called a Garmin Nuvi, back in the days when most cars didn’t offer these as readily and prior to cellphones were in wide usage. It was great and I held onto to it for years after I no longer needed it because I felt it performed so well it seemed like a shame to just get rid of it when it might end up being useful again. Ultimately I gave it to my brother who either used it or sold it on eBay…I forgot to ask those followup questions because I didn’t get to see him that often, and when I did I didn’t think of it. These handheld GPS devices are useful for both trip planning and during trips to the wilderness. They are most often used by hunters, hikers, and campers, and they provide a broad range of services including trip recording, maps and location assistance, and even function as remotes for Garmin’s action cameras which appear to be competition to the widely popular GoPro brand. While this particular model was brandished with Amazon’s ‘Most Popular‘ banner, potential buyers should carefully read all the user reviews for this model. This model appears to have some potential problems and there are quite a few very similar models by Garmin at Amazon too. I’ve really only scratched the surface in this post, choosing to dedicate more time to the various types of technology and then to how the TrackR actually works at the expense of thorough coverage on the large number of bluetooth trackers out there. One reason for doing so is because there are already several really great resources which provide exactly that kind of information, which I’m including below. I love this article by the Verge ‘The Slippery Slope of Bluetooth Trackers’ because it sounds exactly like me and what will happen as I begin to use these little gadgets. In a matter of a day I’ve already out 3 in place! And this app extensive comparison by the Wirecutter is by far the most comprehensive comparison I’ve run across. Tom’s Guide to the Best Key Finder’s in 2017 is another exhaustive coverage article in which they’ve personally conducted testing on each of the products they discuss. I can’t heartily recommend any of these devices currently…although if you have a bunch of them handed to you I’d definitely give them a go. But right now, reviews everywhere for TrackR are less than glowing…and all of the other devices, including Tile seem to have similar problems, on and off again. One notable exception is the iota tracker. I really love the concept behind this tracker and I don’t think it’s price is outrageous given what it does, but I checked their local coverage map and there are very few users of the system in my area. Therefore the crowd sourced feature, which is a big part of it wouldn’t really be available to me. One possibly brilliant strategy might be this. You can set aside the inherent problems of bluetooth it seems to me when considering use of TrackR’s free ios app that they call TrackR Tablet which appears to work exactly like their standalone devices do. Which leaves me thinking that if you’re planning on using this for your cellphone, why not just use their free app rather than buy one of their tracking devices? You can even extend it’s use to protect your purse for example, because your phone would always be in your purse when you’re out and about. There’s such a plethora of devices out there, and so many have very minor differences but then again in some cases there are some major feature differences, that I think if you have a specific purpose in mind it might be worthwhile to check at a place like Amazon that offers a huge selection of these for whatever single purpose use devices might be available. But in terms of buying a whole slew of anyone of these models right now to protect every important thing you own…as warned against in the Verge article I linked to above…I’d seriously advise against it. Amazon Associate Disclosure: I’m an Amazon Associate therefore I may earn a small commission if you make a purchase through my Amazon links. This has no impact on price or any other consequence for you. This entry was posted in bluetooth trackers, GPS Trackers, Trackers and tagged bluetooth trackers, gadgets for finding things, GPS Trackers, iota tracker, learn about trackers, special gps trackers, Tile vs. TrackR, TrackR, TrackR Bravo, TrackR Review. Bookmark the permalink. Hi there! Just thought you would like to know that I am referencing this page in my university dissertation and what a help it has been. The dissertation is on Anti-theft bicycle technology and the main things I focused on were location devices. I actually ended up using both BLE and GPS in my design and thanks to you I was able to have justification for why I chose what I did and got me that oh so high word count! Just wanted to say thank you! Wow, that’s awesome! I’m honored, pleased and happy for you all at the same time! Sorry to take so long replying…my sites have been overwhelmed with spam comments and followers (Russian it looks like.) Finding the authentic ones amongst them has been challenging! This is truly helpful, thanks. Good work!!! I was womdering if you’ve tried any of the true GPS tracking devices and if so, do you recommend any? I haven’t but I’m thinking I may. If I do I’ll add it to this post…OK? Thanks so much for visiting! You’re welcome! Thanks for reading & your kind words! That’s good to hear! Thanks so much for taking the time to let me know! Your new video is great! I love the amount of detail you go into. I can only imagine how much time you put into creating those. But your work is a great resource for anyone looking to buy Bluetooth tracking devices. Thank you! Thanks for visiting and taking the time to let me know! I’m sorry I somehow missed your comment, but really appreciate it! Thanks so much. That’s great to hear…thank you.